Banks have finally started to see Blockchain as a way of providing the kind of services that modern customers expect to get. 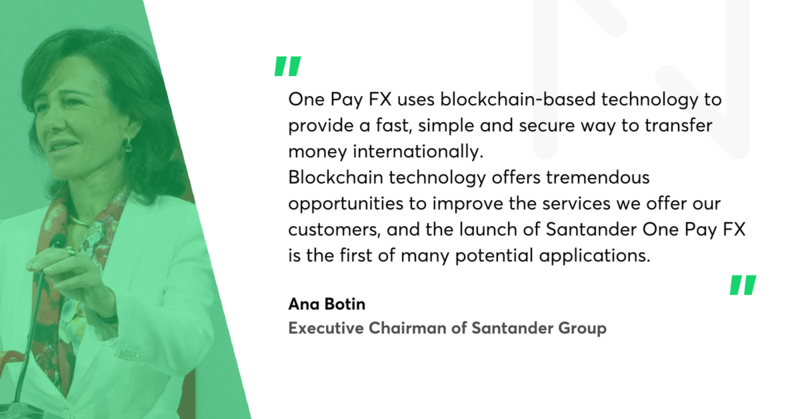 In Europe, Santander is leading the way by launching One Pay FX, the first international money transfer service for retailers based on such platform. It is a limited release and a cautious first step, but Santander’s CEO Anna Botin explained to the Financial Times she believes this innovative technology gives customers the speed and clarity, because multicurrency transfers will be instant and commission-free (within Santander group). To many, this seems like a reaction to services like TransferWise, which has been flying high of late and has recently become the first non-bank to be accepted into the UK’s Faster Payments Scheme and signed a major deal with BPCE Groupe, France's second-largest bank. Reaction or not, Santander has made the move and others are following suit. In the US, JP Morgan has filed a patent for the application of Blockchain to speeding up cross-border payments, which came as a surprise to many but is clear sign that the technology has now crossed over from the periphery to the mainstream. In Italy, 14 big lenders has launched a project on blockchain-based interbank reconciliations. It seems that Blockchain has emerged from the pack as something that the big, traditional financial institutions see as being a more stable bet for the future. And now that the first banks have made their moves, we can expect a rush of others to follow, as nobody wants to be left behind. 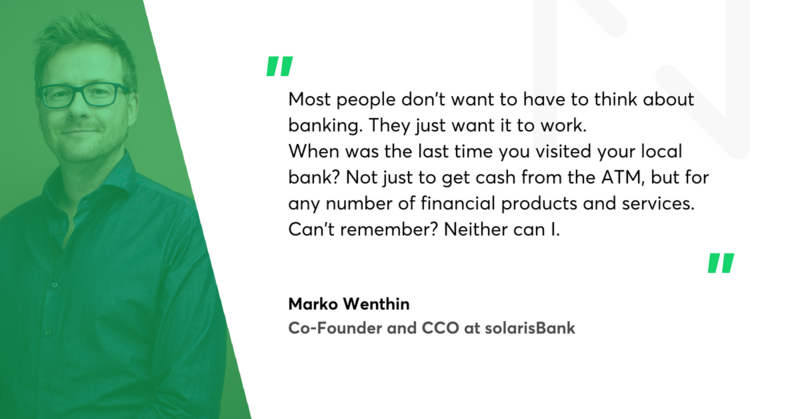 Fintech is already there - with many blockchain advocates, such as Peter Grosskopf, CTO at solarisBank. This doesn’t just mean banks or fintech companies; the lines have definitely blurred. Facebook recently announced that David Marcus, the former president of PayPal and the chief of FB Messenger platform, will lead its Blockchain project. Such a move by Facebook has two important aspects: it further legitimises Blockchain as a genuine and viable investment, and it means that banks need to look at how BigTech companies may be cutting into their market share. With high street banks closing and face to face purely human interactions between customers and service providers dropping to just 10% of all contacts in 2017, banks need to embrace a new way of offering services. And most are now investing heavily in both text and video chat services. Chat is proven to increase customer satisfaction and bring better business results. For the bank, it becomes an absolute must as the customer becomes less able to interact with the bank’s employees in a brick-and-mortar branch. 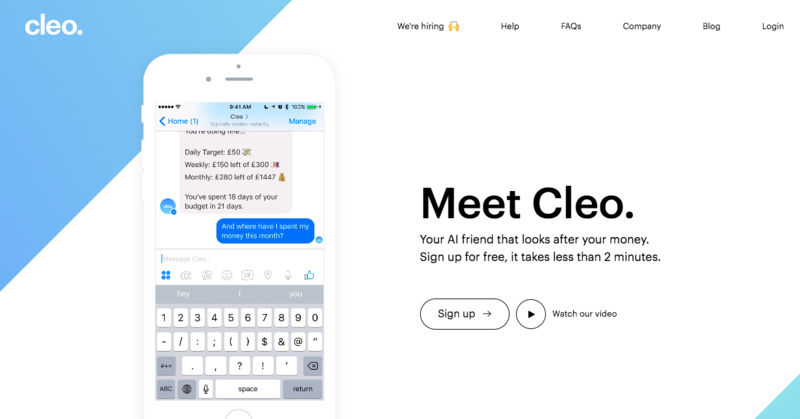 Cleo, AI-powered chatbot. 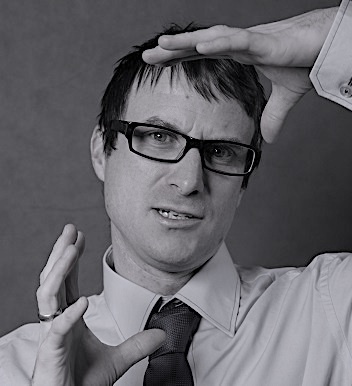 Errol Damelin of Wonga and Taavet Hinrikus of TransferWise bet their money on Cleo's future. Chat agents, be it via video or chat, become the human face of a branded customer experience in the digital world. But, to keep staffing costs down, banks need to simultaneously invest in automation to make sure that customers only interact with humans when necessary. The automation of customer service becomes a gatekeeper; the bank first uses machine learning and algorithms to try and solve the customer’s query without the need for human intervention. The chat option becomes available if the customer still needs help. The trick is to implement automation without dehumanisation, by having the right AI touchpoints to solve problems where possible and human touch where necessary. A clear sign of how seriously fintech companies and banks are about getting the balance right is the roll call of investors in Cleo, the London-based company that offers an AI-powered chatbot as a replacement for banking apps. Errol Damelin of Wonga and Taavet Hinrikus of TransferWise have bought into the service, as have a number of other large industry players, proving that people in the industry see it having a big future. In a competitive, digital market it becomes essential for fintech companies to go from ideation to implementation of a new product at top speed. 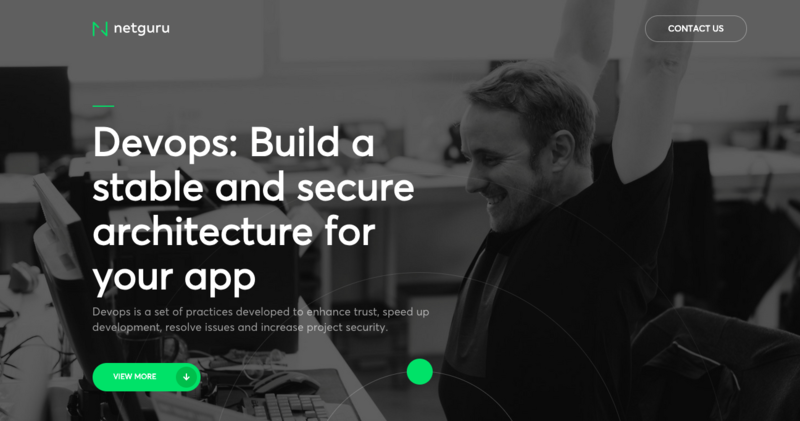 DevOps, which aims to unify development and operations and promotes more deployments at faster speeds, is becoming essential in fast-moving markets. Financial institutions need to act fast to draw in customers. This means getting ideas to market within weeks or even days. The demand for DevOps is growing fast. Zopa is a company that is challenging the notion of traditional banking, having established a system of peer-to-peer lending that matches people in need of loans with trusted partners who have the resources to help. The idea and execution have enabled Zopa to thrive, and it has been recognised by the Financial Times as one of Europe’s fastest growing companies. But as Zopa’s CEO, Jaidev Jandardana, explains in this video (see below), it’s not just the good business that makes a difference in today’s market; it is essential to have skilled technical staff who can move faster than anyone else. “Two days after open banking was launched, we launched a feature that allows users to automatically verify their income,” says Jandardana. Two days! Fast operations generate success in a digital world. Contextual banking is something that really captures the zeitgeist and is a strong bet for where the banking industry is heading. The switch from high street to information superhighways, the acceleration of change caused by technology and the expectation of good service and tangible rewards have impacted the expectations of millenials as to how their services should be delivered. They want a world in which financial services are tailored towards convenience—where spending money is not beset by obstacles, and where AI and big data combine to help advise us and guide us through simple and complex financial transactions in a way that is non-pervasive. In essence, with contextual banking, we are surrounded and constantly aided by financial services, but we hardly notice the touchpoints. That is a trend that many people would love to see become the reality of our times. “Mobile banking will continue to accelerate past standard banking in customer preference, as their digital, user, and customer experiences become more enriched and data-informed. This will include consumer-to-business frictionless digital banking,” says Kirk D. Borne, Principal Data Scientist and Executive Advisor at Booz Allen Hamilton. According to multiple reports and analyses, mobile banking is gaining momentum. "Mobile banking usage is skyrocketing as more consumers experience the benefits of greater convenience, speed and financial insights driven by new app features and upgrades," claims Alice Milligan, Chief Digital Client Experience Officer, U.S. Consumer Bank, Citi. "Over the past year we've witnessed this increase in engagement first-hand, with mobile usage in North America increasing by almost 25 percent, and we don't see this trend slowing down any time soon." - she adds. In fact, this trend is gaining momentum so fast that the future is pretty much already here. According to a survey published in April 2018 by Citibank, 68% of millennials see their smartphones replacing their physical wallets. These are people who prefer to ping their phone against a connected device in the store than endure the hassle of carrying cash. This trend opens the larger market for the likes of N26, Monzo, Atom Bank, Yoyo Wallet and many others. In June, N26 passed the milion customer milestone. As we approach a cashless society, the challenge is to spread that trend across different geographies and user demographics, without leaving anyone behind. As the number of high street bank branches is dwindling, bank robbers are becoming a thing of the past. From 1992 to 2011, the number of bank robberies in the UK fell from 847 to 66. The other reason for this is that criminals moved faster than banks in the cyber world and took their activities online. A shift in cyber-attacks undermines the safety of the industry, but also unlocks many business opportunities. However, there is now a real shift in the understanding of cyber-attacks. “This is a mass-scale criminal ecosystem. We aren’t fighting against individual teenagers in their bedrooms, but an economic crime model that is very profitable,” says Emily Orton, co-founder of Darktrace, a UK-based cyber-security firm. Darktrace was recently listed as one of the top 100 most innovative entrepreneurs in the UK and was showcased in a BBC article describing how they stopped a casino cyber-heist by spotting a weak link in a computer-controlled aquarium. It is clear that banks and financial institutions can no longer rely solely on themselves to provide adequate security. Banks will focus on offering products and services they are experts in, and there is a huge business opportunity for businesses specialising in cybersecurity. 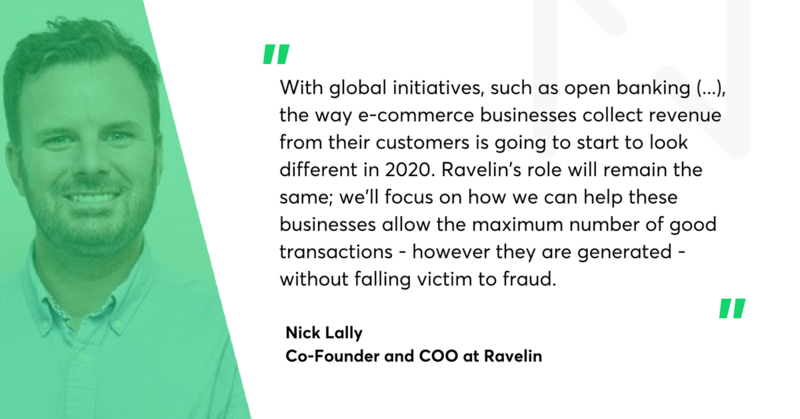 Companies like Ravelin are already filling that space, offering machine learning fraud detection to help companies understand where fraud is taking place and review their procedures and security solutions. One challenge that they emphasise is that companies have to take the lead and protect clients, as users have become so obsessed with speed and two-click solutions that they don’t stop to check if something looks suspicious. Hardly a day goes by without a traditional bank announcing a fledgeling partnership with a fintech company of some kind. In 2018 alone, a host of such deals have been made—from partnerships to mergers to major investments, like those between Swedbank and Meniga or Deutsche Bank and Friendsurance. 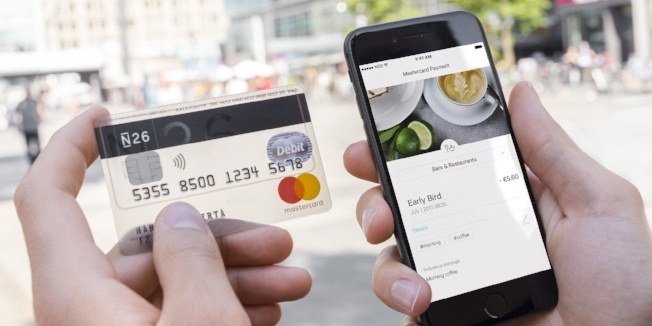 PwC partner and fintech head Steve Davies says: “The banks are looking at fintech as a different way to drive change,” and suggests that “every bank in Europe” is now running its own incubator or accelerator for fintechs whose technology it hopes to benefit from. This trend is obviously as old as the hills; the traditional players in every industry have always invested in or acquired disruptive innovators. Eighty-two percent of banks plan to increase fintech partnerships in the coming years. The question is whether banks are investing in fintech companies to fill the gaps they now know they should have invested in years ago, or whether they plan to actively innovate and try to push their services to new and unexpected places. The suspicion is that banks will have to choose the latter of these two options because there may be a new threat on the horizon. As Jim Marous, the publisher of the Digital Banking Report, points out, it may not be fintech companies that will be the biggest threat to traditional banks in the future; instead, it could be BigTech firms like Google, Amazon, Facebook, and Apple (so called 'GAFA') that will offer the alternative. “With a focus on using huge volumes of customer data to help predict behavior and improve the customer experience, BigTech firms could leverage customer trust and high engagement to introduce even more enhanced financial services,” says Marous, meaning that partnerships between traditional banks and fintech innovators may be a symbiotic relationship that will protect both parties in the future.